How many times has this happened to you? We get a bigger bag to carry more things so that we don’t have to carry multiple bags and then, by the end of the day, we’ve got red, beat up skin, sore muscles, and an aching neck from carrying that bag on our shoulder. Inevitably, we seem to need more these days: multiple phones, wallet, camera, steel water bottle, laptop etc. Though this ‘handbag syndrome’ was coined after women, men who carry heavy laptop bags and briefcases are more affected than ever. Carrying a bag on your Shoulder has a huge impact on Posture and Movement. Large heavy bags depress one shoulder down taking the spine out of alignment. Furthermore, to stop the bag from sliding off, we hike up our shoulder, distorting our posture, overusing and fatiguing the muscles in the area. Most people tend to carry handbags on their dominant side, this causes the muscles in your dominant shoulder, particularly the trapezius muscle, to work harder. This asymmetric load also causes muscles in your spine to compensate for the weight, which can cause the opposite side of the spine to go into spasm. As a result of this overcompensation, everything below the shoulder will have to work extra hard causing pain in your lower back and sacrum. Carrying a bag on one shoulder can also significantly interfere with the normal gait. When you put a handbag on one side of the body, it means the arm on that side can’t swing properly and the other arm has to swing more. An even gait is essential to keeping the body balanced. 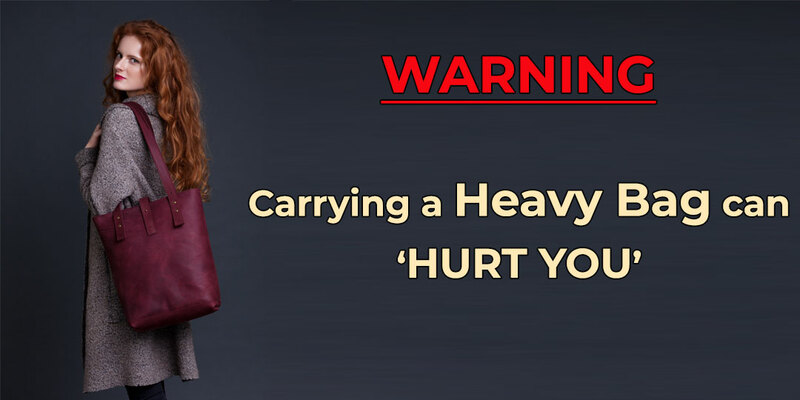 Signs which will tell you that Your Purse is too heavy for you? Alternate shoulders by switching the bag from side to side.This will prevent one side of your body from being overworked and also prevent destructive changes to your posture. Don’t let your bag cause you to lean to one side. Avoid long-straps that cause the purse to bump you at the hip, which can affect the way your hips swing when you walk. You want to be able to swing your hips and your shoulders freely. Try walking without a bag from time to time, letting both arms and hips swing freely to restore your natural gait. If you must carry a lot of item, try to get the travel size option. Choose a handbag that is proportionate to your body size. Don’t purchase a big bag. You’ll only be tempted to fill it. Use a bag with thick, padded straps to help distribute the weight and pressure across your shoulder. Pick the bag that allows you to alternate carrying on your shoulder, around your wrists, or by using its handles. If you cannot seem to reduce the weight of your bag to about 6 lbs or less, consider a backpack or a rolling bag. A backpack is more of an ergonomic bag since it distributes the weight between your shoulders. A rolling bag is the best option because it reduces your shoulder strain completely. Analysing the structure of your body and posture and your change in posture has brought biomechanical changes in your neck, back and shoulders causing more pain. Focus on restoring the joint motion, muscle strengthen, fixing your posture. Helps in relieving pain and discomfort and assisting you to achieve your goals. Educate you in respect to what to and what not to do. Provide home exercises which when performed regularly will assist you to prevent such kind of pain again. It is very important to understand the faster to address and solve the issue the easier it is to be pain-free. Thus if the pain does not resolve on your own for 3 days it is recommended to visit a Physiotherapist. What is Meniscal Injury and how to handle a Meniscal Injury? SMART REHAB: Home exercise programs using smart phone.